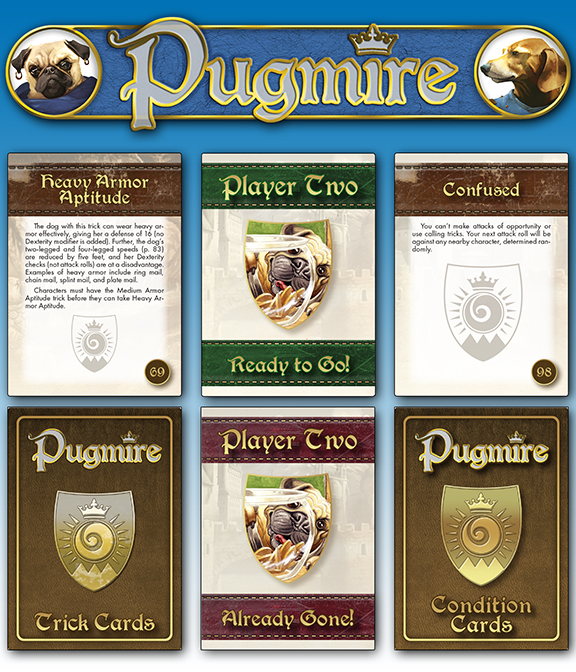 Now Available: Pugmire Card Set 1, and Onyx Dice! Now available in PDF and print on demand from DriveThruRPG: Pugmire Card Set 1 (Trick, Condition, and Initiative Cards)! Also available: Onyx Dice dice rolling app! Available for iOS and Android. The official Onyx Path 3D dice roller with realistic rolling physics! • Flexible rolling rules support most rolling rule modifiers from your character’s Charms, Merits, Disciplines, etc. The app is free to use. You can currently get basic black or basic white dice for free, as well as a basic table surface. An additional wooden table, or tables based on the designs of the deluxe editions V20 and Exalted 3e, are unlockable for a small fee. Also unlockable are dice sets for Scion, Vampire: The Masquerade, Werewolf: The Apocalypse (plain and Umbral Adventure), Mage: The Ascension (plain and Resonance), Wraith: The Oblivion (plain and Plasm), Changeling: The Dreaming, Exalted Solar (plain and Solar Anima), Exalted Lunar (plain and Moonlight Lunar), Dragon-Blooded (plain and Dragon-Blooded Civil War), and Vampire: The Requiem. What’s the difference between the Solar Exalted dice and the Solar Anima dice, other than $2? I can’t tell from the preview in the app. The Solar Anima dice have a golden radiant glow around them. The devs are working on descriptions/demos of the special dice to in an update to the app. Thanks! Is there a way to roll more than three dice on the app? Down at the bottom are + and – buttons to change how many dice you roll. Will there be support for rolling different dice, i.e. Nightmare dice for CtD? Another bug in the App. When u put off the option double 10 it doesn’t count the 10s as successes at all!